Lake Ontario is the 14th largest lake in the world. Although it is the smallest of the Great Lakes in surface area (193 miles by 53 miles), it ranks fourth among the Great Lakes in maximum depth. Lake Ontario is similar to Lake Erie in length and breadth, yet with its greater average depth (approximately 283 feet), Lake Ontario holds almost four times the volume of water (393 cubic miles). The drainage basin covers parts of Ontario and New York State. A few large urban areas, including Ontario's capital city (Toronto), are located on the Canadian shoreline. The U.S. shore is less urbanized and is not intensively farmed. The lake's main fish species include chinook salmon, coho salmon, rainbow trout, brown trout, lake trout, northern pike, smallmouth bass, largemouth bass, walleye and carp. Lake Ontario is famous for it's fantastic salmon fishery. Among the many species present, the chinook or pacific salmon are the kings in these waters, many topping the scales at well over 30 pounds. With fish nearing the 40 pound mark caught annually. Other less predominant salmon species are the coho salmon, pink salmon and atlantic salmon. In spring, most salmon congregate off shore feeding heavily on spawning smelt and alewifes. Trolling a variety of spoons using downriggers is the technique of choice for most anglers. The spoons are trolled above and below marked fish usually within 1 mile of the shore. Some of the best spoons are nasty boys, williams, evil eyes and northern kings. Pier fishing can also produce some nice fish for shore anglers. Casting spoons, such as cleos and pixies on windy days at dusk and dawn can be hot. In summer, salmon move out into deeper water off shore. Once again relating to schools of baitfish. Trolling spoons using downriggers near marked baitfish schools is always a good bet. In fall, salmon once again move inshore, this time to spawn, with large numbers of them congregating at river mouths. Many boats can be seen trolling these areas with spoons and plugs. Shore anglers cast spoons and plugs or bottom fish with marshmellows and spawn along piers lining river mouths. 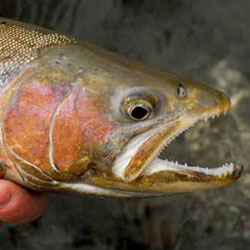 Many species of trout inhabit Lake Ontario, although none is more sought after than the rainbow trout or steelhead. Known for it's brilliant leaps when hooked, anglers can enjoy catching world class fish. The average Lake Ontario, rainbow weights 6-8 pounds, although trophy steelhead weighting over 20 pounds are not uncommon. Open water fish are caught using the same techniques as those used for salmon, with fish moving inshore in the spring and fall, and deeper during the summer months. 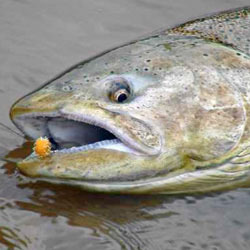 River mouths are the prime targets for the shore angler during spring and fall. Casting spoons or spinners at river mouths or angling with spawn, either on bottom or under a float are proven tactics this time of year. Steelhead spawn in the spring, and many anglers do a yearly pilgrimage to one of the many rivers draining into Lake Ontario. Crowding well known rivers, anglers float fish for migratory trout, with spawn, flies and worms. LENGTH: 193 miles / 311 km. BREADTH: 53 miles / 85 km. MAXIMUM DEPTH: 802 ft. / 244 m.
VOLUME: 393 cubic miles / 1,640 cubic km. WATER SURFACE AREA: 7,340 sq. miles / 18,960 sq. km. DRAINAGE BASIN AREA: 24,720 sq. miles / 64,030 sq. km. (including islands): 712 miles / 1,146 km. ELEVATION: 243 ft. / 74 m.
Each detailed map provides depth, contours, structure, boat ramps, and updated fishing information. 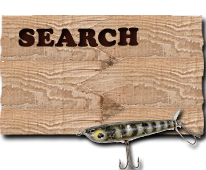 Lake Ontario fishing maps also include lake info such as gamefish abundance, forage base, water clarity, weedline depth, bottom composition, complete latitude/longitude grid lines and dozens of GPS waypoints & coordinates.